These sliders have been designed to offer unsurpassed protection to your engine and frame in the unfortunate event of a lowside or tip over. Riders around the world have tested our products on the street and track with outstanding results. 4) From the right side, install the slider into the frame and insert the rod through the slider till it meets the factory engine bolt. Using a rubber mallet, very gently drive the factory bolt out. You are essentially using the new frame slider engine rod, to drive out the stock engine rod. This should help ensure the motor is never unsupported during the install. It should come out pretty easily. Do not use excessive force as this may damage the threads on the supplied rod. Although unlikely, if it does not come out easily you may have to lower or raise the engine supporting blocks a bit. 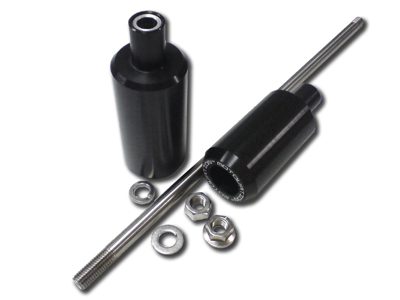 5) Once the factory bolt is driven out and the supplied threaded rod is protruding out from the left side (the end with the shorter length of threads), install the left slider using the supplied gripnut and flat washer. It may be necessary to loosen or tighten the nuts to ensure that sufficient amount of threads are exposed on each side. Tighten the nuts to factory torque specifications. Below is a customer install video that may provide additional reference. Please note, this is a customer supplied video and not an official Motovation install video. The bike used in the video is a Ducati Scrambler and is for reference only.